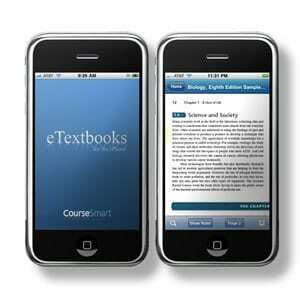 College students can now argue that the iPhone is required for college. Beyond the benefit of having your textbook always with you, many of the eTextbooks are 60 to 75 percent of the cost of their physical cousins. Nice for an app that is free from Apple’s App Store. Check out the app for yourself or read more about it. This entry was posted in Uncategorized and tagged app, college, CourseSmart, eTextbook, iPhone, savings, student, textbook. Bookmark the permalink.